I always know that Spring is not far away when the area is a buzz about the Bald Eagle. 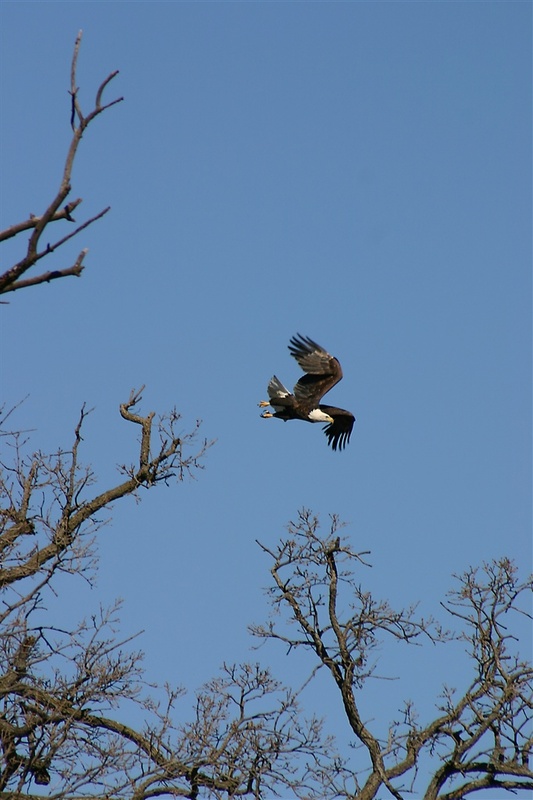 Here is an article on Eagle Watching and two events that are happening in the Westby area. It will give you a great appreciation for the bird. Plan a trip and stay at the Westby House Inn and be spoiled with history, comfort and hospitality. One of the great pleasures offered in Driftless Wisconsin is the abundance of wildlife that make this rugged land their home. Watching a deer hurdle a fence line or a muskrat plunge into the river never gets old, and provides a privileged peek into the fleeting world of nature. Certainly no glimpse compares in sheer grandeur to the sight of a bald eagle soaring over the river valley. Sitting on a breeze like royalty on a throne, the bald eagle reigns supreme over its river kingdom.The overlook at Pikes Peak Park across from Prairie du Chien is one of my favorite spots for viewing eagles. Standing above the Mississippi River Valley, eagles can often be seen sailing on the wind overhead. Eagles are plentiful throughout the region. Bald eagles can be seen cruising the skies over the Kickapoo River, shopping for their next meal. They can also be seen along Highway 27, which dissects the two river valleys, sometimes feasting on fish entrails dumped in farmer’s fields by commercial fishermen. Two events coming in late February and early March help celebrate this rich heritage of eagle watching. On February 25, Prairie du Chien observes Bald Eagle Appreciation Day, an event filled with activities that shed light on the life of an eagle. Programs include live eagle demonstrations, an American Eagle Documentary from the PBS Nature Series, live raptors, craft activities for children, puppet shows, with birding experts on hand all day. And oh yes, outdoor viewing through spotting scopes. Downtown Prairie du Chien will also feature a walking eagle gallery. On March 3, Ferryville will celebrate Bald Eagle Day. Ferryville sits on a wide expanse of the Mississippi River known as Lake Winneshiek, where the river unfolds below your feet from the Observation Deck in the downtown. At the Village Hall, regional experts will present live eagle programs, a presentation by the US Fish and Wildlife, and a talk by Chloris Lowe of the Ho Chunk Nation. Be sure to meet Lois the owl, who will be supervising a hooting contest for all ages. And take in the Kids Crafts and a photo exhibit by local photographer Larry Knutson. I can’t imagine a better weekend spent than eyeing some eagles. You may not possess their keen eyesight, but you’ll discover an appreciation for their place atop the world.